This is a second post in the series of posts about “Separate Domain from Presentation” Refactoring. IRefactor.CoursesView – represents the View (CoursesView) without the domain object. IRefactor.Common – represents the domain object (CoursesDS) without the UI elements. I know how to manipulate model objects in order to perform required application logic and persistency. I don’t know how to visualize to the user any information or how to respond to any action the user may take. I know how to visually represent to the user information (that will be provided for me by the Presenter). I know how to perform simple data binding and possible simple UI actions that modify the visual layout of the screen. I don’t know what to do when an application logic or persistency are required. I know how to handle user requests to the View (which are more complicated than a simple data binding) and how to delegate those requests to the Model. 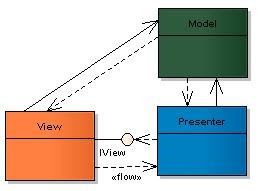 I know how to query the Model in order to delegate information to the View, if any should be displayed to the user. I don’t know how to draw widgets graphically (that’s View’s concern) and I don’t know how to perform any application logic in order to derive that information (that’s Model’s concern). Those who have sharp eyes, will probably spot here the use of a Supervising Controller (that doesn’t introduce right away drastic changes to the code in the spirit of Refactoring. Later on, one could turn the View into the Passive View while continuing to refactor). Rename the IRefactor.CoursesView.FrmMain class to CoursesView. Go to FrmMain, right click on it and use Refactor » Rename command to rename it easily. 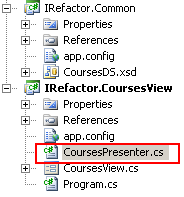 Create a class CoursesPresenter in IRefactor.CoursesView. Add to CoursesPresenter a constructor that receives CoursesView instance. Compile the Solution and execute the Unit Tests. Let’s start with the Save event delegation. If you look closely at the coursesBindingNavigatorSaveItem_Click event handler, you will notice that the method has two different responsibilities. It treats the required data binding and then performs data access operation in order to save the CoursesDS domain object. To separate the concerns, let's use another Refactoring step called “Extract Method”. Select the data access code, right click on it and use Refactor » Extract Method command to extract the code into a new method called “Save”. // Changed from auto generated code. After breaking the coursesBindingNavigatorSaveItem_Click method we suddenly realize that the Save method doesn’t belong to the CoursesView class as it does a data access operation. By all means this operation should be inside the domain model (business logic). In the meanwhile we will push the method inside the presenter. In CoursesPresenter create a new method called Save. 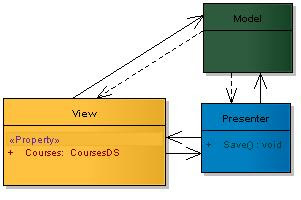 The method will retrieve the CoursesDS domain object from the CoursesView and save the object into the DB. 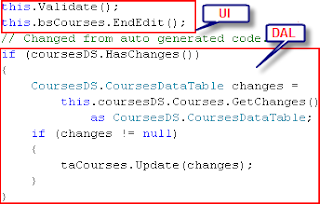 Copy all the code from the CoursesView.Save method into the CoursesPresenter.Save method and adjust the new code to its new “place” (pay attention to the CoursesTableAdapter that needs to be redefined). Now, for the fun part; Put all the code within the CoursesView.Save method inside remarks and declare CoursesPresenter object that calls to its Save method. Walla! You have successfully moved a data access method from the view to the presenter. With continuous refactoring you can push that method even further in the data access layer. We introduced a new presenter class, called CoursesPresenter. The same should be applied to the Load method (FrmMain_Load). I won’t show it here, just use the same principle. Here is the schematic view of the current IRefactor.CoursesView project. Events – the presenter handles complicated user events by subscribing to the view. Interfaces – the presenter should manipulate the view only via an interface.Failing to do so, will break the view’s encapsulation. Take a look here for a good summary on Smart Client development.